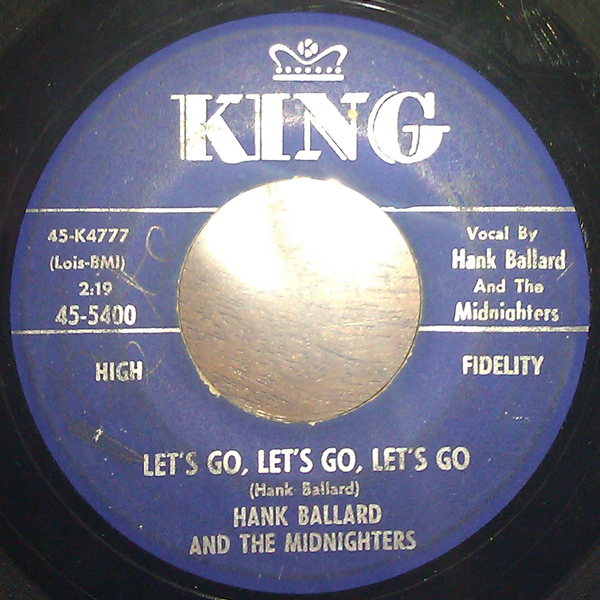 Soul Serenade: Hank Ballard And The Midnighters, "Let's Go, Let's Go, Let's Go"
Hank Ballard had a number of hits, but someone else scored bigger with one of his songs. If you weren’t around for the Twist craze of the early ’60s it might be hard to understand just what a phenomena it was. Perhaps you lived through the disco era, which was also dance-oriented, but although the Hustle was pre-eminent, it wasn’t really about one dance. The Twist was massive. Unfortunately its creator never got the glory. Hank Ballard was born in Detroit in 1927. He joined a vocal group called the Royals, who were signed to Federal Records, in 1953. The group had a #6 R&B hit with “Get It” that year despite the fact that some record stations refused to play the song because the lyrics were thought to be suggestive. The group changed its name to the Midnighters, and in 1954 they had a major hit with “Work With Me Annie,” a song written by Ballard. It was #1 for seven weeks on the R&B chart, and spawned a number of “answer” records including “Annie Had A Baby.” All of the records were banned from the airwaves by the FCC. The Midnighters had several other hits that year and the next, but then they suffered through a fallow period that lasted until 1959. By then they were called Hank Ballard and the Midnighters, and they had moved from Federal to its parent label, King. There were several more hits over the next couple of years, starting with “Teardrops On Your Letter,” which reached #4 R&B in 1959. It was the B-side of that record that made history however. It was another Ballard-written song called “The Twist.” The next year, Chubby Checker’s cover of “The Twist” went to #1 on the Pop chart, and repeated the feat again two years later. It was the only song to reach #1 in two different years during the rock and roll era. Hank Ballard and the Midnighters were not done yet. In 1961 they had a #7 hit on the Pop chart with “Finger Poppin’ Time,” and a #6 hit with “Let’s Go, Let’s Go, Let’s Go”. That was about it though. The group never had another hit after 1962. By 1965 they were done. Hank Ballard went on to a solo career that never really reached the heights, but did include a 1969 album called You Can’t Keep A Good Man Down that was produced by James Brown, and a couple of moderately successful singles. He was inducted into the Rock and Roll Hall of Fame in 1990, but the induction did not include the Midnighters. Hank Ballard died in 2003. He knew a lot of success in his career, particularly while working with the Midnighters. But the real golden ring, the one grasped by Chubby Checker with Ballard’s song and the dance that went with it, remained just out of reach. While “The Twist” will always be a part of his legacy, Ballard’s most important role was that of a key player in the birth of rock and roll. As an aside, I have a photo of my father doing the Twist at a party in 1964. If I am ever asked exactly when the Twist craze ended, I can just break out that photo.